GTD: Victoria, last summer you were in the GTD Cross-Country Conditioning Program. Before that, how many summers did you do the Speed & Conditioning program? Victoria: I did the speed and conditioning program for two years before doing the XC program. GTD: Why did you switch to the XC program? Victoria: I switched to the XC program because as the year progressed I realized running came natural and that there was really no point of doing the speed and conditioning program if I was going to focus on running. This was a rather minor reason for doing the XC program, but XC is also my next season after the camp so it gets me ready as well as excited for the season to come. GTD: What was different about the programs? Victoria: The difference is that in the XC program we focus more on distances. 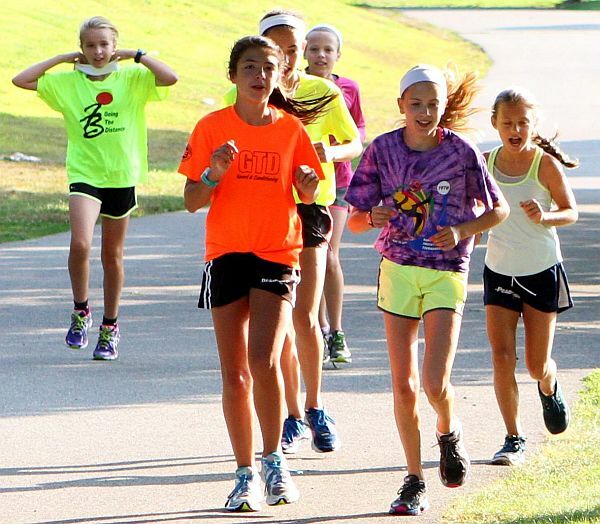 In the speed and conditioning program the focus is more on short distances with reps. Also the coaching styles are very different because of the difference in activity in the XC program; the coaches can be a little more laid back than the speed and conditioning program coaches. GTD: Each day of the program is a bit different, and the drills become progressively more challenging, week to week. There are cones, hurdles, rope ladders - you're running, jumping, moving sideways, straight ahead and backward. And there's core work. What drill or drills do you like the most, and why? Which ones don't you like, and why? Victoria: Quite honestly I liked all of them and there was not one that I disliked. Sure, they can be painful and most of them are, but all that they do is help you in different areas of your racing. Also I couldn't choose to dislike any of the drills because it would affect how I race and the outcome of the race. GTD: Can you name 2 or 3 advantages you gain over your competition by doing the program? Victoria: One advantage I get from doing the camp is definitely bursts, which really help me to get by someone in a race, whether it's the beginning, middle, or end The two other advantages that really help are quickness and agility. I definitely gained a lot more of those by doing the XC program. GTD: Tell us some highlights of your XC racing last fall. Victoria: Well, last fall's XC season was my best so I have a lot of highlights, but I'll just share a few. One that came pretty early in the season was winning a dual meet with the other team being our biggest rival. The next two highlights are much later in the season and they are the league and state meets. For our league meet I came in ninth place with a personal best from the year before, with significant improvement. The state meet for me I would say was the biggest achievement of the year. I medaled for my team, coming in twenty-fifth; it was a huge achievement for me and I still cannot believe it even though it was many months ago. GTD: Any winter and spring sports? Victoria: For winter and spring sports I play basketball and soccer. I wouldn't give up my training for the world so I also train year round. Basketball and soccer don't really keep me in shape, they could if they had to but I would be nowhere without my training. Besides what Coach Braz always says is that they are just games -- the only real sport is running.